Jonathan Thomson shrugged off his poor early season form to storm into the first-round lead at the Made in Denmark, where Ryder Cup hopefuls Thorbjørn Olesen, Matt Fitzpatrick and Eddie Pepperell endured mixed fortunes at this, the final qualifying event to gain an automatic place in Thomas Bjørn’s European Team to face the USA in Paris in four weeks’ time. 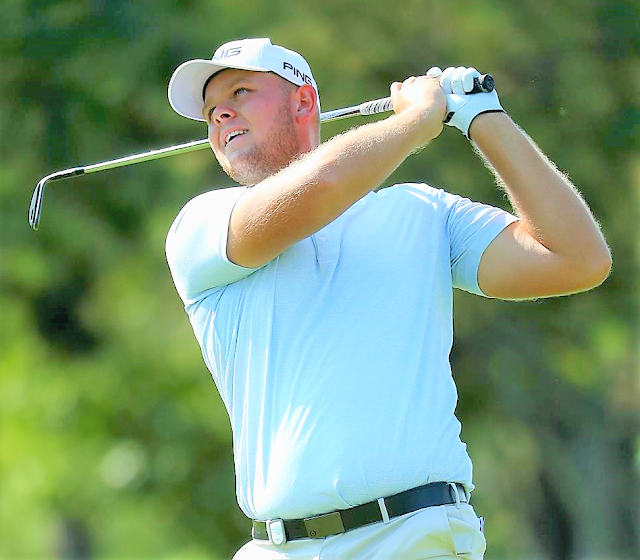 Thomson stormed out of the blocks at the Silkeborg Ry Golf Club to card a fine eight under par opening effort of 64 to take a two-shot lead over Matt Baldwin, Christian Bezuidenhout, Lukas Bjerregaard, Josh Geary and Brett Rumford. While Thomson was forging his way to the top of the leaderboard, the Ryder Cup subplot at the Made in Denmark began to develop in earnest. Olesen made a fast start in his bid to retain the eighth and final automatic qualifying spot to Bjørn’s team. The 28 year old Dane needs to finish in a tie for seventh place with one other player or better to guarantee a Ryder Cup debut. One under through three holes, Olesen looked to be in control but lost momentum and dropped four strokes before two birdies in his last three holes saved the round and saw the Dane finish on one over par. The two men who can pass Olesen to qualify for the Ryder Cup Team – the English duo of Matt Fitzpatrick and Eddie Pepperel – both need to win this week. Pepperel, playing with Bjørn, matched the Ryder Cup Captain’s two under 70; while Fitzpatrick had to settle for a level par 72. Fitzpatrick was playing alongside Ryder Cup Vice Captain Robert Karlsson, a man who had reason to celebrate his first round in Denmark as he became the first Swedish player (and only the 11th player in history) to reach the landmark achievement of 600 European Tour appearances. Jonathan Thomson (-8): “It’s fantastic to get off to a great start for a change. I have been playing some great golf recently but not scoring, so to get off to a low scoring start today was great. This is my first Made in Denmark. This course is a great lay out and a beautiful setting. “I have been playing well but not scoring. I had a good lesson on iron play in Prague last week and it has really tightened up my iron play and given me more opportunities to give myself more birdie chances. Last week I played fantastic and didn’t hole anything, whereas today I played to a similar level and holed some putts. Eddie Pepperell (-2): “The swing didn't feel at all good at times. I hit some very good shots, the back-to-back five woods (on the 11th and 12th) I'll probably remember for the rest of my life – I might have to retire that club after those two. “He (Bjørn) has still got it, I enjoy watching Thomas whenever I get the opportunity to play with him and Martin (Kaymer). These guys I've watched on telly for years so I'm beyond the point of nerves playing with these guys and still in awe to a degree. Matt Fitzpatrick (Level par): “I had a fee chances early and felt like I hit the irons solid all day. I had six chances inside 15 feet which is great. You know, I make a few of those putts and all of a sudden I’m under par. But then I made a couple of silly mistakes and finish level. But that’s the nature of the game I suppose. “My game feels does feel there but it’s just golf – very fine margins. I drove the ball well on the front nine and just putted terribly and then I didn’t really put it in position off the tee on the back nine. I’ll go to the range now and try and figure it out and go low tomorrow. Thorbjørn Olesen (+1): “I didn’t play well today, didn’t have a tempo in my swing. If you play well, there’s a lot of chances out there, but if you don’t play well, it’s a really dificult course, and unfortunately I didn’t play well. 69 N Møller (Denmark); N Tinning (Denmark); D Willett (Eng); G Havret (Fra); R Ramsay (Sco); T Pieters (Belgium); A Chesters (Eng); F Zanotti (Paraguay); S Vincent (Zimbabwe); P Widegren (Swe); J Morrison (Eng); N Højgaard (am) (Denmark). 70 H Sturehed (Swe); S Brown (Eng); T Bjørn (Denmark); E Pepperell (Eng); A Otaegui (Spn); A Wu (China); N Cullen (Australia); C Hanson (Eng); T Lewis (Eng); H Porteous (SAf); J Walters (SAf); C Koepka (USA); M Warren (Sco); J Smith (Eng). 72 A Olsen (Norway); M Tullo (Chile), T L Aiken (SAf); R Bland (Eng); T Pulkkanen (Finland); D Lipsky (USA); S Webster (Eng); A Connelly (Canada); J Hansen (Denmark); Y Miyazato (Jpn); D Brooks (Eng); S Gallacher (Sco); S Brazel (Australia); R Karlsson (Swe); P Hanson (Swe); M Fitzpatrick (Eng); C Ford (Eng); F Dreier (Denmark); C Blomstrand (Swe); F Aguilar (Chile); P Angles (Spn); M Millar (Australia). 73 D Horsey (Eng); S Khan (Eng); G Bhullar (India); D Ghim (USA); A Hansen (Denmark); J Dantorp (Swe); T Nørret (Denmark); J Winther (Denmark); R Wattel (Fra); M Kaymer (Ger); M Armitage (Eng); S Kjeldsen (Denmark); J Guerrier (Fra); T Olesen (Denmark); J Choi (SKor); M Nixon (Eng); J Kruyswijk (SAf).